Anne Nies hopped off the corporate ladder and landed in a wetland. There, she was charmed by the enchanting yet elusive white lady’s-slipper orchid (Cypripedium candidum). Or maybe it was the mountain of data that pulled her in. Anne Nies at work in the field. 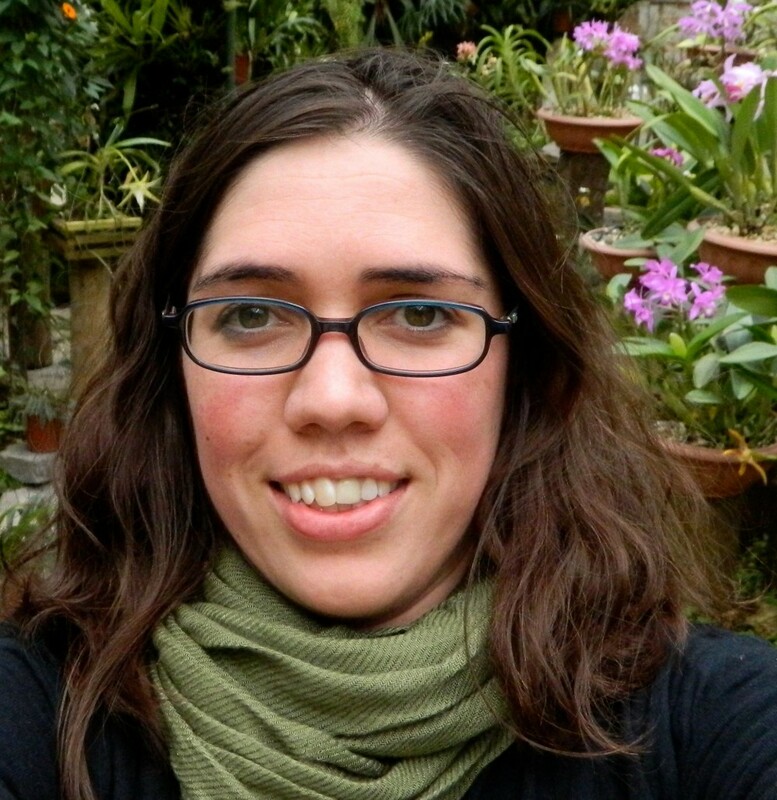 After years of working in management, Nies enrolled in a master’s degree program with the Northwestern University-Chicago Botanic Garden Graduate Program in Plant Biology and Conservation. She was curious to see how she could apply her mastery of numbers and modeling from an earlier degree in mathematics to conservation challenges. Now 1½ years later, as she prepares to graduate in June, she is completing a study of the state-threatened orchid that has a spotty record of success in Illinois. 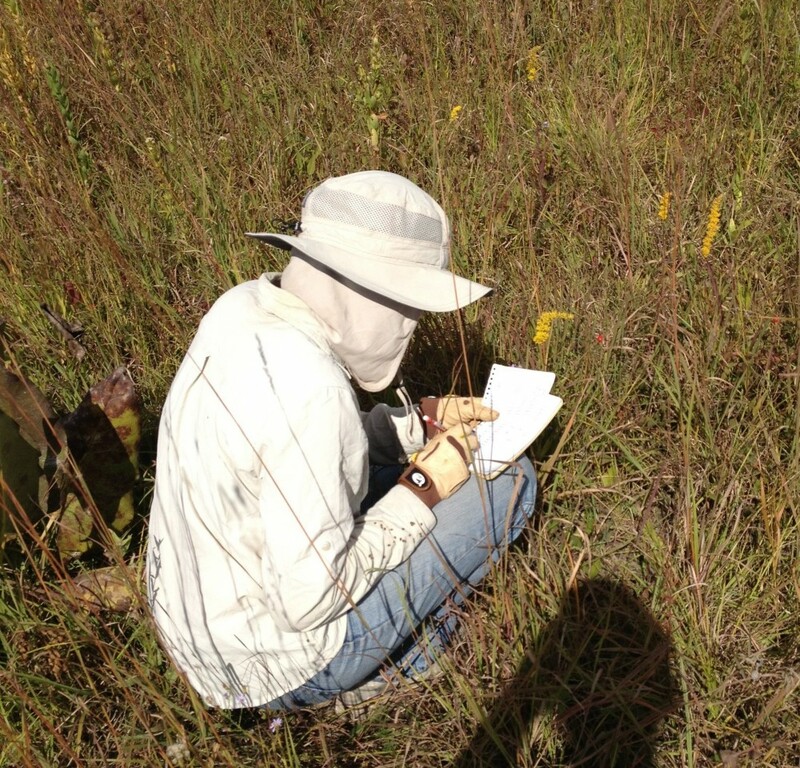 Working with more than ten years of data collected by Plants of Concern volunteers, she has sorted through some perplexing trends with the delicate white plants. 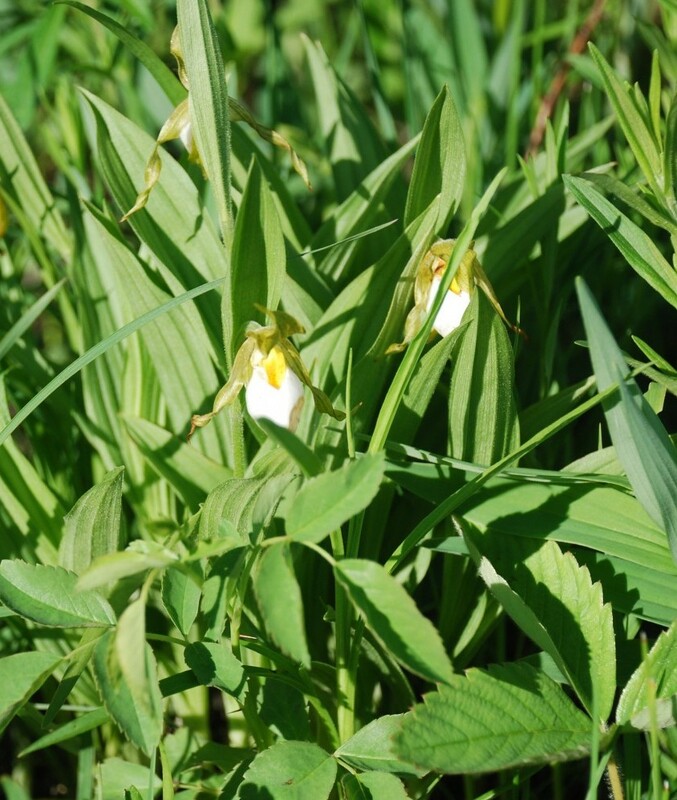 The orchids showed varied success levels in separate locations that are all classified as high-quality prairie. If the locations were equally strong, then what was causing certain populations to thrive and others to falter? It was a question Nies had to answer, because, as she explained, when one of these plants perishes, it is almost impossible to restore or replace. White lady’s-slipper orchid can be camouflaged by surrounding foliage. After a preliminary review of the data, armed her with questions and theories, Nies traveled into the field in the spring and again in the fall for a first-hand analysis. The initial challenge was to actually find the plant. When it isn’t flowering, white lady’s-slipper blends in easily with surrounding foliage. So she learned where to look and found herself returning again and again to wet and sandy locations, such as wetlands, within the prairie ecosystem. Nies brought back samples of plant tissue, soil, and even root tissue where fungus lives to the Garden’s Soil Laboratory in the Daniel F. and Ada L. Rice Plant Conservation Science Center for exploration. She hoped to find that a high level of fungus, which lives in the roots of many orchid species, was leading to the healthier populations. But that wasn’t what she found. 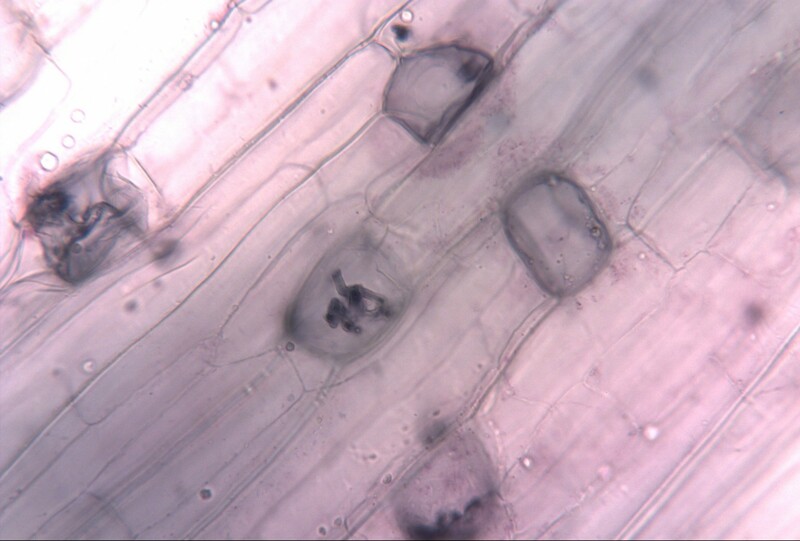 Helpful fungi live in the roots of orchids and can be identified through a microscope. Lab results showed that in locations with nutrient-rich soil, the plants had high levels of the beneficial fungi. They also had low levels of photosynthesis—the internal process that creates food from sunlight for a plant. They were not doing very well. In locations where the plants had higher levels of photosynthesis, Nies found that they had soil low in nutrients. “What I’m hoping is that knowing the nutrient levels and the high sand composition can help maybe inform land managers and also with the propagation of this orchid,” she said. Nies plans to incorporate this information with her pending conclusions into her final thesis for her master’s program, before going on to pursue a doctoral degree in the near future. Much like math, according to Nies, everything is connected in botany, which is what makes it appealing to study. “One of the reasons I’m so interested in orchids is because they are so deeply connected to their habitat,” she explained. Anne Nies explores the Tropical Greenhouse. Even though she has transitioned to botany, Nies will surely stay connected to her background in pure math, bringing a new perspective and skills to mounting scientific challenges. “It’s amazing to me how much we still don’t know, and how much is out there that still needs to be learned,” she said. When she has time to wander, Nies heads to the Garden’s Tropical Greenhouse, where there is always another plant calling her name.